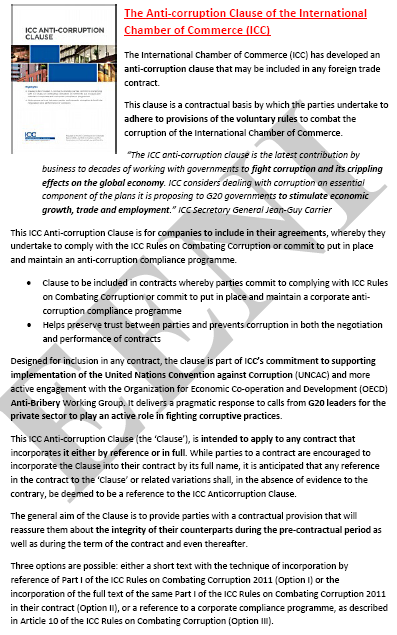 Syllabus of the Online Course (Subject): Anti-corruption Clause of the International Chamber of Commerce (ICC). Learning materials in (or Cláusula Anticorrupción Clause ICC Anti Corruption). In 1919 (Paris, France) was created one of the largest business organisations in the World: The International Chamber of Commerce (ICC). 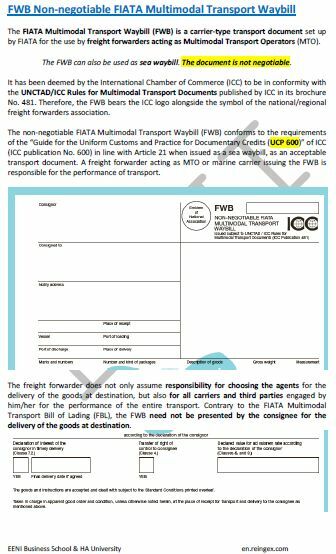 One of the objectives of the ICC is to promote open trade and investment, creating instruments for companies such as Incoterms, Uniform Customs and Practice for Documentary Credits (URU), standard contracts, codes of good practice or the anti-corruption clause. The ICC also creates the International Court of Arbitration. The International Chamber of Commerce consists of companies and organisations in more than 130 countries. The International Chamber of Commerce has developed an anti-corruption clause that may be included in any foreign trade contract. This clause is a contractual basis by which the parties undertake to adhere to provisions of voluntary rules to combat corruption of the International Chamber of Commerce. The anti-corruption clause serves both for Small and Medium Enterprise and large multinationals. An exporting company wishing to include the anti-corruption clause in their international sales contracts does not need any permission from the International Chamber of Commerce. The anti-corruption clause is based on the principle of self-regulation. The acceptance of the Anti-corruption Clause is voluntary by the companies involved. The only restriction is that the interpretation of this clause corresponds to the International Chamber of Commerce.